A number of our customers have expressed interest in learning about the simple little razor blade radios that were built by American soldiers to use in their foxholes on the battle fields of Europe and the Pacific during World War II. These radios were essentially crystal sets that used blue razor blades for detectors because crystals were almost impossible to obtain under the conditions the G.I.s faced in those days. In the early 1940s, tube type portable radios were fairly large and used short-lived, expensive batteries that would have been hard to find in the field. Also, the Germans had sensitive, radio direction finders that could pick up the local oscillators of superheterodyne portable receivers. They could use these devices to "home in" on the locations of the Allied emplacements in order to direct artillery and aircraft fire. Because of this, it was forbidden to use portable superhets on the front. Still, the G.I.s had the desire to listen to news, entertainment, and the "all-important" baseball scores, along with other sports. Battles did not rage constantly and sometimes there were many hours and even days when they had to sit in their foxholes and wait out the boredom. Most locations were close enough to radio stations to receive them with simple sets. Many of the G.I.s were radio hobbyists before the war and they had the knowledge to make simple radios out of junk they found around them. Many of them knew that materials other than crystals could be used to detect radio waves. Headsets, wire, screws, and washers could be scrounged off of blown-up vehicles. Pieces of board came from ammo and supply boxes. Toilet paper tubes were usually available for use as coil forms and it was easy to find pencils and safety pins. The word got around through the "grape vine" and many soldiers made these radios even if they didn't understand how they worked. The Nazi Propaganda Ministry, oversaw the operation of powerful broadcast stations that targeted the U.S. Forces with American Swing music, such as the popular Glenn Miller, and of course, there was the infamous Axis Sally. The music was good on these stations and it wasn't hard to ignore the Nazi propaganda. If one were really lucky, he would be able to get the U.S. Armed Forces Radio Service. This network carried many popular shows, news, sports, and music from back home - and in English to boot! Several people wrote in to QST magazine about foxhole radios during World War II. Among those was young Lieutenant Paul M. Cornell, W8EFW, who wrote of a design he used in the Pacific in 1945. It was one of the first such articles that mentioned using a pencil lead for a contact. This Borden Radio Company kit is named after him in appreciation for his article in the September, 1945 issue of QST Magazine. High quality parts are used throughout. The pre-drilled base board is made from clear pine that is not unlike the wood from ammo boxes and "C" Ration crates the G.I.s could get in the battlefield. The pre-punched coil form is made from heavy cardboard shipping tubing that gives the appearance of the G.I.s toilet paper tubes, but is much stronger and will stand up to many years of use. A solid steel rod is used for the tuning slider. This is similar to the wire used in WW-II to bind ammo crates together. A black flaired knob is used for moving the tuning rod. The PAL Single Edged Blue Razor Blade detector is just like the blades that many soldiers used for their radios. Nickel plated brass fahnestock clips are used for the antenna, ground, and headset connections. A sensitive ceramic earphone is included with the kit. All parts, screws, washers, sandpaper, and wire are included in this fine quality kit. 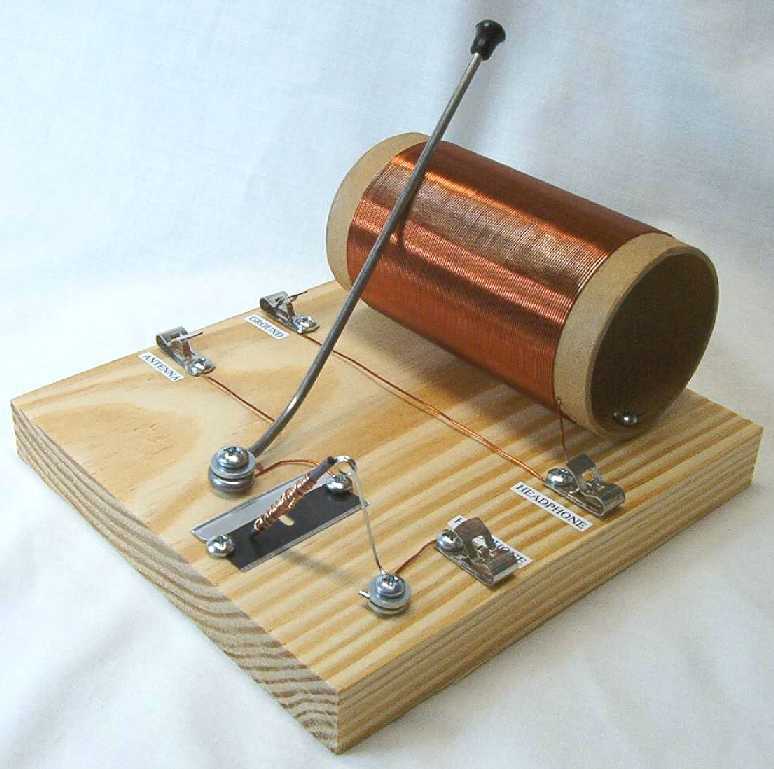 This is a great kit that a kid of any age can build and learn about the simple radios the soldiers built so long ago. A brief history explains the facts about how these radios came about and how they were used by the G.I.s in World War II. The easy-to-understand instructions were designed for beginners. No soldering is required. Nothing else to buy except an outside antenna kit that is available from Borden Radio Company for $19.95. Soldering is required. This radio also performs exceptionally well with the Radio Shack Speaker Amplifier we sell for $14.99. The Radio Shack Speaker Amplifier requires an adapter cable we sell for $4.95.